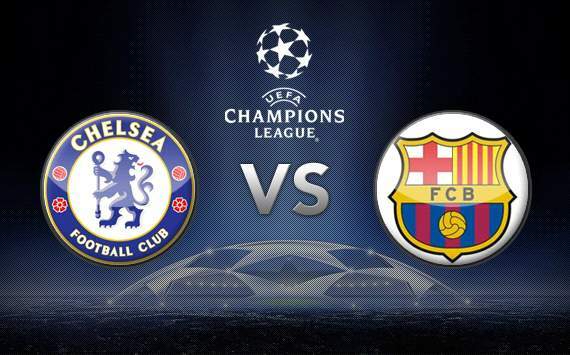 They say familiarity breeds contempt, and Barcelona's rivalry with Chelsea is a tremendous case in point. There was not a shred of enmity between the two sides when they collided for the first time in the Champions League at Stamford Bridge during the 1999-2000 competition. However, having met on nine more occasions in the interim, the Blaugrana and the Blues are now the fiercest of rivals. Indeed, from a Chelsea perspective, only Real Madrid have a more deep-rooted dislike for Barca, believing the Catalans to have repeatedly benefited from preferential treatment from match officials during their increasingly controversial encounters, starting with Didier Drogba's contentious dismissal at Camp Nou in 2005 and culminating in referee Tom Henning Ovrebo's now infamous handling of their semi-final second-leg clash in London three years ago. However, the bitterness goes both ways because outlined below, the Blaugrana are also entitled to feel that some big calls have gone against them in their always eventful clashes with the Blues. As already alluded to, this particular rivalry had its origins in a red card. 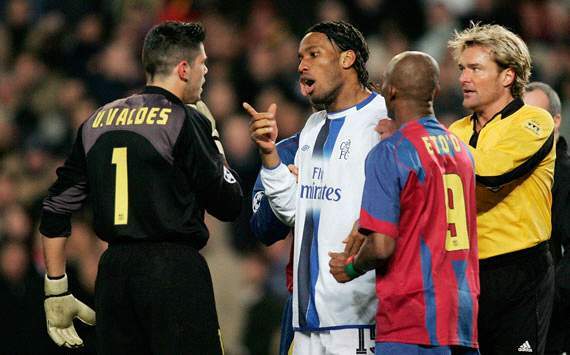 Chelsea were leading 1-0 in the first leg of their last 16 tie with Barca during the 2004-05 campaign courtesy of an own goal from Juliano Belletti when Drogba collected a second yellow card for a lunge on Victor Valdes. The Chelsea forward’s studs were up but the ball was there to be won and Valdes made the proverbial meal of the challenge, rolling about the turf holding his left shoulder even though it appeared that Drogba - already in the book for a clumsy challenge on Rafael Marquez - had made little, if any, contact with the goalkeeper. Chelsea boss Jose Mourinho understandably felt aggrieved by Drogba’s red card but his reaction to the game-changing dismissal was shameful, the Portuguese crying conspiracy by claiming that referee Anders Frisk had invited Barcelona coach Frank Rijkaard into his dressing room during the half-time interval. Mourinho’s wholly unfounded accusation resulted in the Swedish official being inundated with death threats from a minority of impressionable, idiotic Chelsea fans and he promptly retired from the game. The whole sordid episode, which resulted in Mourinho being labelled an “enemy of football” by Uefa referees' committee chairman Volker Roth, remains one of the blackest of stains on the Portuguese coach's reputation. The controversy provoked by Mourinho’s outburst meant that the return leg was played out in an atmosphere of animosity and acrimony. 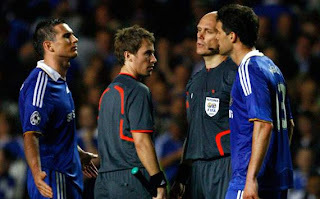 The hostility only intensified after the goal which settled the tie in Chelsea’s favour, with Ricardo Carvalho appearing to obstruct Valdes as he attempted to deal with John Terry’s goal-bound header. The Blaugrana appealed vociferously for a free kick, and television replays appeared to suggest that Valdes had been the victim of a sly shirt pull, but Pierluigi Collina allowed the goal to stand, giving Chelsea a 4-2 advantage on the night and 5-4 win on aggregate. With all of that in mind, it was hardly surprising that tempers flared at full-time. Rijkaard, having behaved with impressive dignity despite seeing his integrity called into question after the first leg, allowed his emotions get the better of him after the final whistle and was involved in a touchline row with then Chelsea assistant coach and recently sacked coach Andre Villas-Boas. Several Barca players, including Ronaldinho, also became embroiled in some handbags on the sidelines and Eto’o subsequently accused a Chelsea steward of calling him "a monkey". It was a sad but perhaps inevitably distasteful end to the most spiteful of Champions League ties. As fate would have it, the two sides were drawn to face one another in the last 16 again the following season. Fireworks were expected upon Barca’s return to Stamford Bridge and the sparks began to fly on 36 minutes when Asier Del Horno was sent off for a wild swing of the boot at Lionel Messi. The full-back’s challenge was, at best, clumsy; at worst, reckless. Either way, referee Terje Hauge deemed it worthy of a red card. What angered Chelsea, though, was that Messi had appeared to cast a glance in the direction of the match official while he rolled about on the ground. Eventual champions Barca won 2-1 in London, and Mourinho sarcastically praised the Argentine's acting skills in his post-game press conference, only worsening relations between the two clubs. If Chelsea were frustrated by Hauge’s handling of the 2006 clash at Stamford Bridge, they were positively enraged by compatriot Tom Henning Ovrebo’s performance at the same venue three years later. The Blues felt that they were denied four clear penalties, with their first spot-kick appeal coming midway through the first half with the hosts 1-0 up on the night - and on aggregate - courtesy of a stunning volley from Michael Essien. Florent Malouda ran at Dani Alves down the left wing, and was twice pulled back by the Blaugrana defender before eventually being blatantly obstructed by the Brazilian's forearm in the area. Hauge did blow for a foul but awarded Chelsea a free kick on the basis that the initial contact had been made outside the box. Anelka was also involved in Chelsea’s third penalty shout. With just under eight minutes of normal time remaining, Florent Malouda rose wonderfully to beat Dani Alves to a long punt forward and knocked the ball on into the area. Reading the situation brilliantly, Anelka immediately attempted to flick the ball past Barca centre-half Gerard Pique only to see the Spain international block it with his outstretched right arm. It looked like a stone-wall penalty but Ovrebo again decided otherwise, deeming the contact accidental. Having been denied the opportunity to seal their place in the 2009 final from the penalty spot, Chelsea were then hit by the most devastating of sucker punches, Andres Iniesta drawing Barcelona level on the night - and putting them ahead on the away goals rule - when he unleashed the most sublime first-time strike from the edge of area just over two minutes into injury time. Chelsea’s players were visibly stunned but they still summoned up the energy for one last onslaught on the Barcelona goal and they had a fourth and final penalty shout in the dying seconds when Eto’o blocked a Michael Ballack volley with his arms as the Cameroonian turned his back on the ball. However, Ovrebo waved away the furious protests of the former Germany captain and, moments later, blew the full-time whistle. The manner of the exit was too much for Chelsea to take and Ballack continued to vent his fury as the referee attempted to leave the field, while Drogba had to be restrained by team-mates as he attempted to accost the match official and ended up launching a foul-mouthed tirade into a pitchside TV camera. Hopefully, tonight's game is not marred by similarly ugly scenes. All eyes will be on the referee tonight, Felix Brych.